, a Greek writer, born in Alexandria, under the reign of Ptolemy Euergetes king of Egypt, was a scholar of Callimachus, whom he is accused of having treated with ingratitude; by which he drew upon himself the indignation of this poet, who gave him the name of Ibis, from a bird of Egypt, which used to purge itself with its bill. 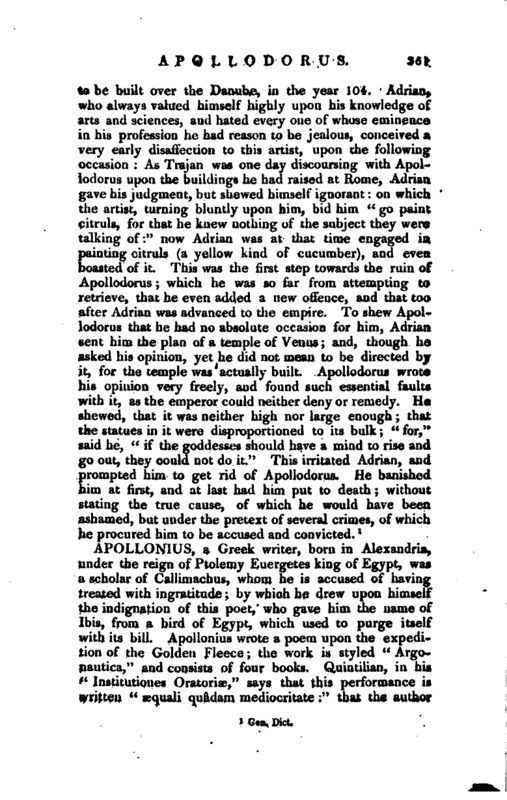 Apollonius wrote a poem upon the expedition of the Golden Fleece; the work is styled “Argonautica,” and consists of four books, Quintilian, in his “Institutiones Oratoriic,” says that this performance is written “aequali quadam mediocritate;” that the author | observed an exact medium between the sublime and low style in writing. 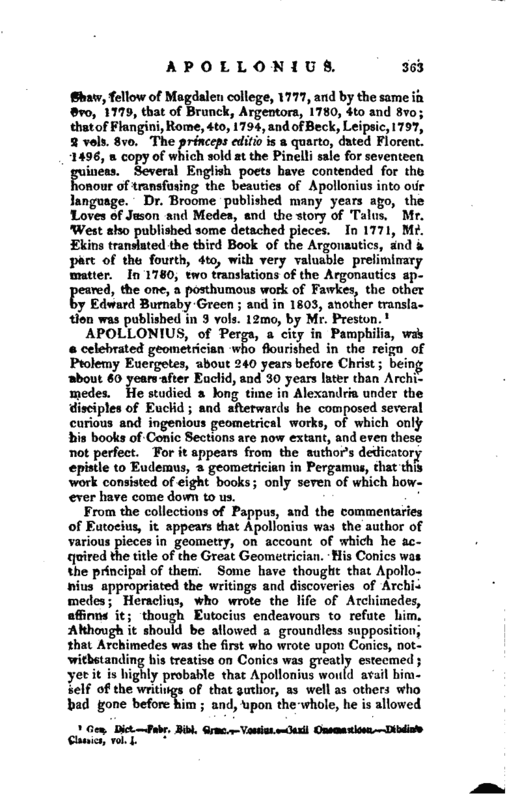 Longinns says also that Apollonius never sinks in his poem, but has kept it up in an uniform and equal manner: yet that be falls infinitely short of Homer, notwithstanding the faults of the latter; because the sublime, though subject to irregularities, is always preferable to every other kind of writing. Gyraldus, speaking of this poem, commends it as a work of great variety and labour: the passion of Medea is so finely described, that Virgil himself is supposed to have copied it almost entirely, and to have interwoven it with the story of Dido. Apollonius, not meeting at first with that encouragement which he expected at Alexandria, removed to Rhodes, where he set up a school for rhetoric, and gave lectures for a considerable time; thence acquiring the name of Rhodius. Here it was that he corrected and put the finishing hand to his Argonautics, which being publicly recited, met with universal applause, and the author was complimented with the freedom of the city. He is said to have written a book “Concerning Archilochus,” a treatise “Of the origin of Alexandria,” “Cnidos,” and other works. 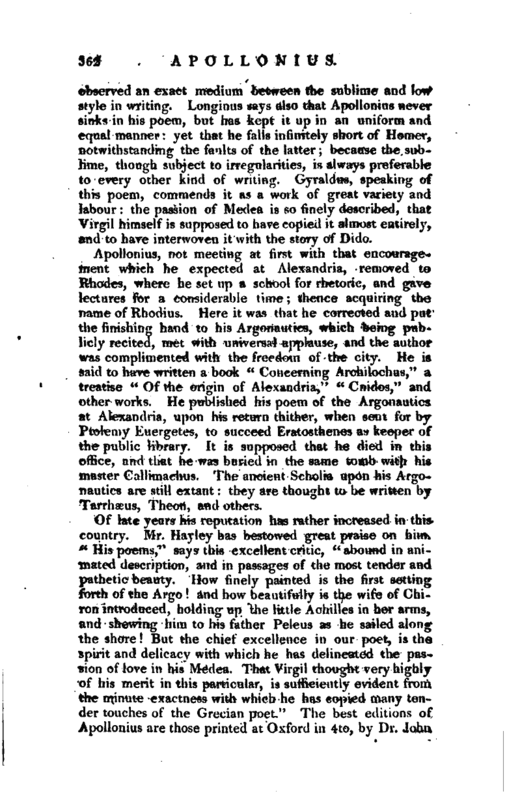 He published his poem of the Argonautics at Alexandria, upon his return thither, when sent for by Ptolemy Euergetes, to succeed Eratosthenes as keeper of the" public library. It is supposed that he died in this office, and that he was buried in the same tomb with his master Callimachus. The ancient Scholia upon his Argonautics are still extant: they are thought to be written by Tarrhscus, Theon, and others.